With September having drawn to a close, Western Manitoba’s two post-secondary institutions are thrilled with the reaction to this year’s “Great Chemistry” campaign to welcome students for the fall term. This year’s campaign focused on the benefits of the partnership between ACC and BU, as well as the benefits that students bring to the community. Businesses, community organizations, staff, faculty, and many more enthusiastically embraced the campaign again this year. Building on the success of last year’s inaugural initiative, Assiniboine Community College and Brandon University (BU) used boulevard signs, banners, social media and advertising to showcase and celebrate the importance of students to the community. The theme of “Great Chemistry” helped highlight not only the ongoing, fruitful partnership between the two institutions, but also the wonderful benefits that they and their students bring to Brandon, to Dauphin and to all of Westman. 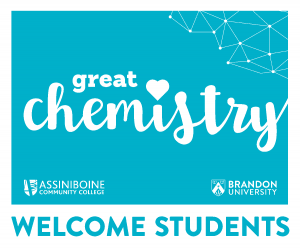 Along with staff and faculty who put up the distinctive “Great Chemistry” signs at their own homes, Brandon and Dauphin’s business community enthusiastically embraced the opportunity to show off their own welcome for post-secondary students. Now that this year’s campaign has wound up, all supporters are encouraged to take down and stow their signs for next year. Assiniboine of BU volunteers will also come collect any signs to be stored on campus. Email communications@assiniboine.net or Communications@BrandonU.ca to make arrangements. Joint initiatives like this year’s “Great Chemistry” campaign continue to demonstrate the deepening tradition of collaboration between Assiniboine and BU. In 2014 the institutions, along with the Province of Manitoba, signed Growing Together – Vision 20/20, a memorandum of understanding aimed at fostering collaboration between the two institutions to meet student, community and social needs. With ongoing partnerships that include students sharing residence space and transferring credit through 2+2 programs, the institutions continue to make Brandon, Dauphin, and all of Westman a place where students can find the options, flexibility and amenities that they are looking for when pursuing their post-secondary education.